Music has always played an important role in my life. The older I get, the more thankful I am that I had the good fortune of learning to play an instrument; for that I thank my parents for buying me my first horn and all the teachers that invested in me through the years! The instruction I received helped me to become fairly competent. I am by no means a household name and I’ve never won a grammy- haven’t even been nominated! I am happy with my skill set though. I have often wanted to be better but I learned to square with the fact that my skill set is satisfactory enough. It has allowed me the privilege of playing with many wonderful musicians through the years and even experience playing across this great country and overseas. In many ways my journey to becoming a pastor was built on the shoulders of being a musician first- long story maybe another time. The bottom line is, music is a gift that you can have forever- I encourage everyone to give it a shot! The interesting thing about making “good music” is it is not always about the skill set. Good music IMO is as much about the way you connect with your listener as it is with the level of skill you have. Don’t get me wrong, I love the musicians that can do things with their instruments that literally make you want to jump from your seat and scream in excitement! If you have ever been to a great show with me you know… I ain scurred (I am not scared) to express the joy in my heart when someone does something amazing! For me, music has always been about a connection between the artist and the audience. This relationship is beautiful, too. 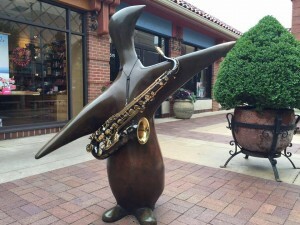 Think about this: what else can you do, where you can use an object that is incapable of doing anything on its own (imagine a saxophone in it’s case), then you apply yourself to it and through it and out of it comes out a sound that is unique to you, a sound that conveys your thoughts and your deepest emotions. Then through this sound, this voice, you can literally move others. Playing with several good musicians is amazing also because it becomes a shared voice; it’s like having an extended conversation with your closest friends and others have the good fortune of being invited in to participate in it. Good music effects us emotionally. It pumps us up, it calms us down, it takes us to places that we can only imagine being. That’s why I love it so much. I love a great recorded song, the melodies can stay with me for years. I also love going to a live concert and being amazed by the guitar solo of the ages and singing along with 25,000 of my closest friends! I love the street musician, hustling for a buck getting his inner Bob Seger on. And I still love playing for an audience, the one that connects with me, the same way I have been connected with by so many others. Music is a great gift from God! What are some of your best musical memories/experiences?